Feel as if you are in a professional ballet company and experience personal high level coaching! Four weeks of intensive Ballet Technique, Contemporary Jazz taught by Victoria Kickham, Variations, and Pas de Deux (offered if male students are enrolled), and supplemental classes such as Floor-Barre and Gyrotonic . Working hours will be from 10:30am until 5pm Monday-Friday. 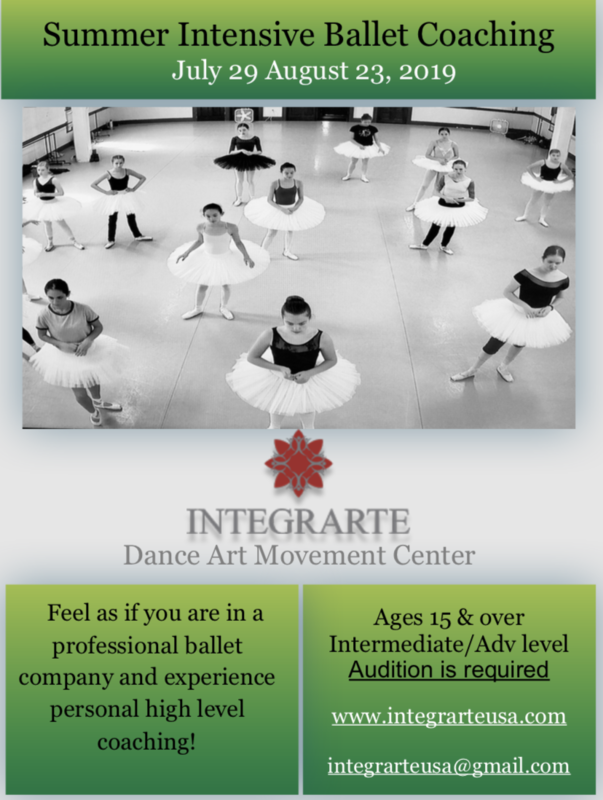 On Saturday students will take INTEGRARTE’S open class, with additional coaching as needed. Director and founders of INTEGRARTE Principal dancers Erica Cornejo and Carlos Molina will focus on teaching and coaching selections of the classical ballet repertoire. Participants will be offered the daily experience of a professional company dancer, and prepare for the next step in their career. Guest teachers may be invited to participate throughout the Summer Program (TBA). Students have the option to enroll for 1, 2, 3 or 4 weeks. Tuition payment and a processing fee of $30 USD are non-refundable. Students who withdraw before the start of the program will forfeit all payments made to INTEGRARTE. Note: there is no fee to apply. Accepted students will receive an email from INTEGRARTE that includes payment information, including a link to Mindbody to pay by credit card. A $30 processing fee will be included at that time. The tuition fee and processing fee must be paid by June 30, 2019. If you want to secure your spot we recommend making your payment as soon as you can. Tuition fee for 1, 2, 3 or 4 weeks must be paid by June 30, 2019. Note: INTEGRARTE does not provide housing. Students must fine their own housing during the summer intensive. INTEGRARTE will do its best to provide students with information. Students who have participated in our classes or previous Summer Program don’t need to submit a video. These students only need to fill out the application form. First CREATE AN ACCOUNT or LOGIN. Then fill out and submit the APPLICATION FORM, including a full body photo in any ballet position. Option B: Submit your video online with your online application. Videos should be submited via link (URL) to an online video sample (ie youtube). Once you have been accepted to the Summer Intensive Ballet Coaching, you will be notified and provided payment instructions. Your spot in the program will be secured once payment is received. Spots are limited, please submit the application form and video information as soon as possible. The video should have Center exercises or a variation of your choice. Not longer than 5 min. Applicants will receive notice of the results by email as soon as we receive the full materials. When accepted to the SIBC (summer intensive ballet coaching), students must register before June 30th, 2019. Admission and space is granted on a first-come, first-served basis. (Once the program reaches full capacity, students will be placed on a waiting list.) Please be sure to send your payment on time to ensure your place in the program. LADIES and MEN are welcome to wear any color of tight and leotard/t-shirt. Please bring a Yoga mat for floor exercises. LADIES: please bring pointe shoes, flat shoes, a rehearsal tutu, long skirt ( it could be character or any kind as long is lightweight and simple ) Skirts are permitted for class. MEN: flat shoes Note: Jewels, watches and any other kind of accessory will no be permitted in classes. Ladies could wear small and no dangling earrings.